Nanosized materials are processed by cells in different ways than small molecules, such as standard drugs, opening up the possibility of using them as drug delivery vehicles in nanomedicine. Encapsulating antibiotics in nanosized carriers could improve their delivery, thus also reducing the occurrence of antibiotic resistance. In this research project, targeted carriers of different design will be developed in collaboration with the Laboratories of Prof. Wolfgang Parak (Marburg University, Germany) and Prof. Francesco Stellacci (EPFL, Switzerland). This will also include strategies to reduce clearance by the immune system. Their behavior on cells and bacterial cultures will be tested with cell biology approaches, using a combination of methods such as flow cytometry and fluorescence imaging in order to track their uptake and efficacy. The student will be trained in the design of targeted nanoparticles to deliver antimicrobials to bacteria, verifying their targeting efficacy and testing their safety and eventual side effects on human cells. Chemistry, pharmacy, nanoscience, biology or related discipline. Candidates with a background in physical chemistry and particle synthesis who are willing to move towards biology, or vice versa students from cell and molecular biology, pharmacy, or a related discipline who are willing to learn methods of nanoparticle synthesis and physicochemical characterisation. Surfaces are prone to attract pollutants which is a severe problem in (bio)medical applications. Bacteria will attach themselves to a surface upon an infection, which will ultimately form a biofilm. Biofilms are highly problematic for medical implants as the bacteria are less affected by the applied antibiotics and hence are able to spread. Preventing biofilm formation will enable less usage of antibiotics leading to less resistance. The aim is to develop a broadly applicable surface coating based on the concept of liquid surfaces using polymer brush technology combined with ionic-liquid polymers. 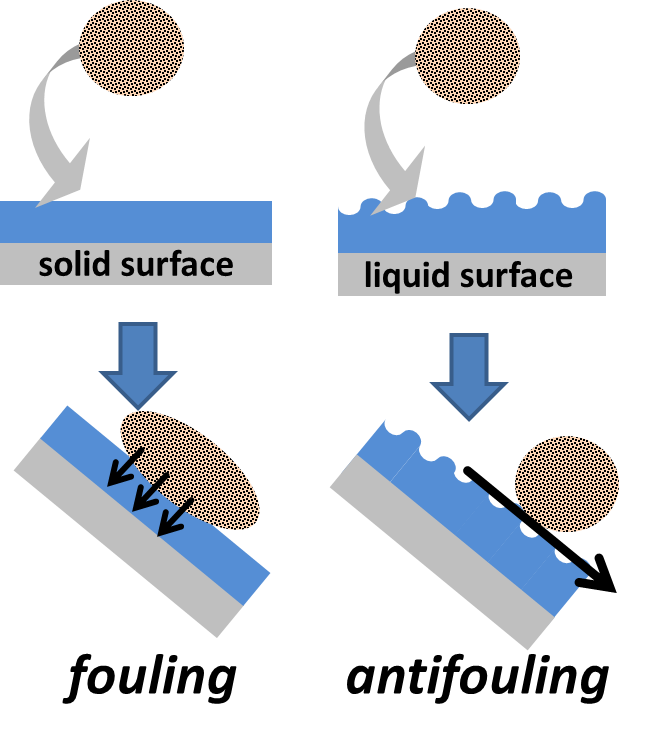 The combination of liquid properties with surface-tethered polymer brushes enable the liquid surface to be slippery. This prevents any contaminant including bacteria to attach themselves to the surface. We use these surfaces as well as conventional brushes to investigate yeast-bacteria interactions to elucidate complex behaviour of mixed populations. The project is medically driven but with outreaches to the food industry. Physico-chemistry of initial microbial adhesive interactions – its mechanisms and methods for study. FEMS MICROBIOLOGY REVIEWS 23(1999)179-230. The student will be trained in both surface modification using ATRP as well as physico-chemical sciences entailing bacterial adhesion determination using flow setups, bacterial adhesion determination by AFM and analysis techniques such as fluorescence microscopy. 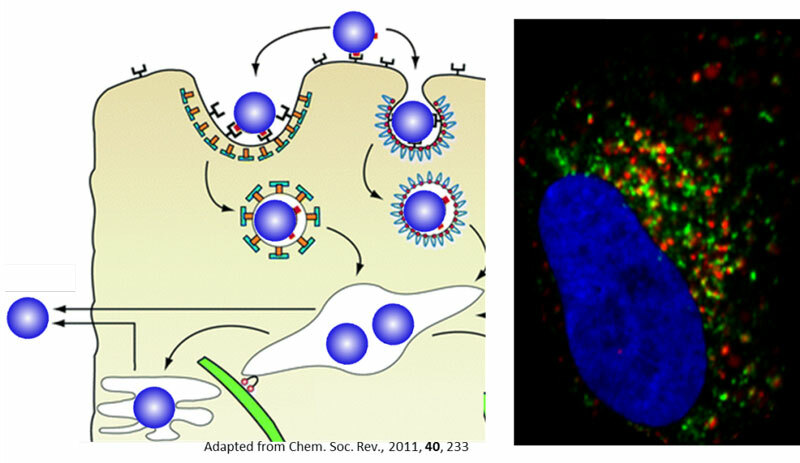 Virus particles are an interesting class of materials for investigating new biomedical applications including drug/gene delivery, bio-sensing and bio-imaging. Bacteriophages are considered as a class of antimicrobial particles as they selectively infect bacteria and hence can be envisioned as a natural treatment against microbes. Very recently, we developed a new method for functionalizing the surface of protein structures including virus particles with polymers in a single step. The aim of the research project is to use Bacteriophage M13 combined with the novel synthetic approach to lower the host immune response allowing bacteriophage treatment to be longer effective against infections within the body. van Rijn, et al.,Adv. Funct. Mater., 2014, 24, 6762. Student will be trained in enzymatic organic synthesis, analysis techniques such as TEM, AFM and confocal microscopy as well as being introduced to microfluidics as a tool for high throughput synthesis and analysis. Phage display is a molecular biology technology invented by George P. Smith in 1985 and was subsequently developed in the 90s by several research groups in order to select antibodies, therapeutic proteins and in general as support methodology for protein engineering. 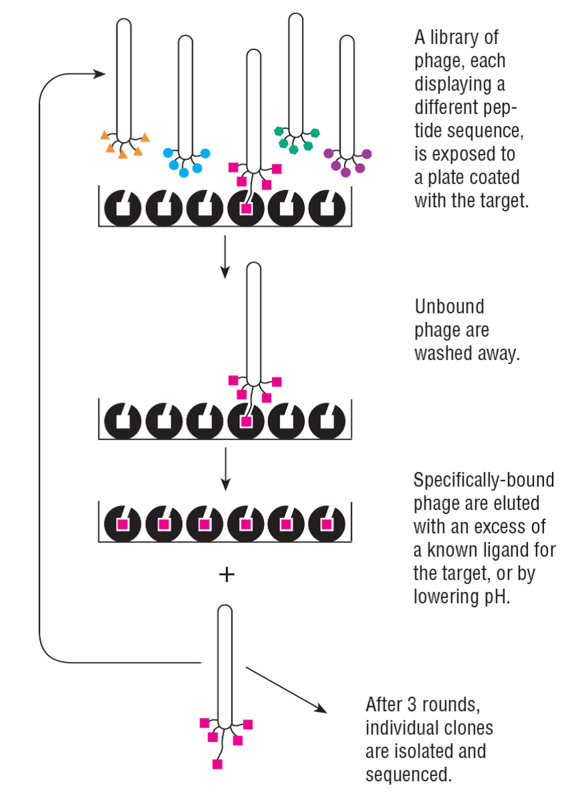 This technique is applied for the irrational design of peptide binders and it serves the purpose of obtaining peptides or proteins with particular characteristics using evolution as a unique tool for their selection. At the head of a bacteriophage, a library of peptides will be generated that will be panned against target proteins (Figure 2). In the Alert program, it will be exploited for the selection of strong peptide binders against novel targets in bacteria. The student will be trained on phage display to evolve peptide antimicrobials. Conventional dental composites are prone to accumulate biofilms and plaques in vivo, leading to secondary caries especially at the tooth-restoration margins. Recurrent caries is the main reason for restoration failure, and replacement of failed restorations accounts for nearly 70% of all restorative dentistry with an annual cost of $20 billion in the United States alone. Innovative composite materials are called upon with improved clinical performance, and preferably with additional functionality such as remineralization stimulation. The aim of this research project is to develop antimicrobial silica-silver nanocomposites for clinical applications. 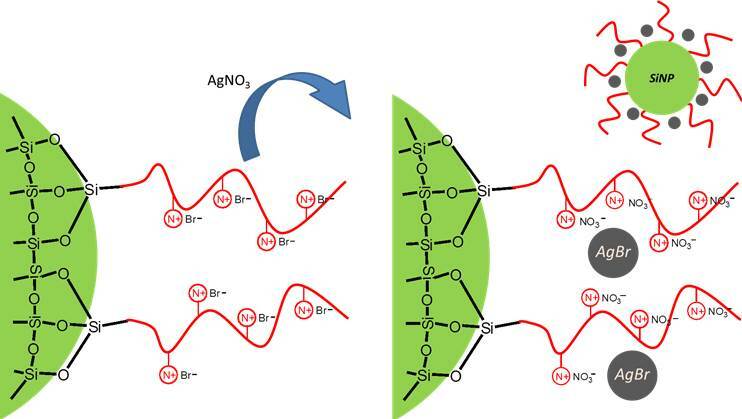 During the Alert Program, quaternary ammonium-containing copolymers (pQA) are anchored on the surface of silica nanoparticles (SiNPs). Subsequent addition of AgNO3 induces in situ formation of AgBr nanoparticles in the polymer shell. The formed SiNPs-pQA/AgBr nanocomposites are then incorporated into a number of matrix resins customized for different clinical applications. These silica-silver nanocomposites will be extensively evaluated, in vitro and in vivo, in their physical, mechanical, biological, microbiological and aesthetic properties to meet the demands for clinical use such as dental restorative materials, bone-graft substitutes and/or coating materials for medical devices and implants. Furthermore, 3D printability of these nanocomposites will be explored in order to fabricate personalized 3D printed dental and medical devices while maintaining their antibacterial property. The student will be trained in developing innovative 3D printable antimicrobial polymeric materials for dental adhesives and composites with the help of nanoparticle fillers.